Running 5 miles with loved ones? Priceless. 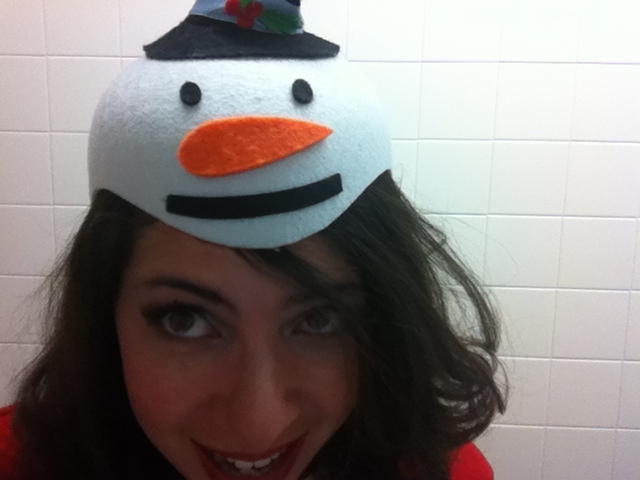 6:30AM and I donned running tights and a snowman cap (see Exhibit A). But you could imagine my surprise when my sister agreed to join me in Newton instead. What’s more? She wanted to run. Naturally, the thought had crossed my mind to invite her along in the first place. The idea was even ignited by Coach Rick. However, like most normal people, I thought she’d opt for the sleep. Clearly she is just as crazy as I am. Also joining me in Newton was my friend, Trisha, with whom I’d become acquainted through blogdom – a cyber friendship, if you will. In fact, it was this very blog which had connected us. We’d made attempts to meet in the past, all failed mostly due to my propensity to overbook… and in the last case, overbooze. So I finally invited her to come experience a training run with us on the hills of Newton. I knew that at least 1 of the following awesomes would occur: 1. I’d finally get to meet her 2. she would meet lots of new running friends and 3. she would absolutely love Coach Rick. As usual, <<pats self on back>> I was right. It was the perfect storm, really. I had my sister, my new friend, and all of the wonderful people in the marathon coalition in one room. And after another inspiring talk by Coach Rick, we set off on our 5-mile adventure. Although we each had slightly different paces, the moments where our paths crossed were truly wonderful; these are moments I will treasure as I embark further on this new year of training. There is something special about merging different facets of acquaintance. It is one of my favorite things to do, often yielding amazing results. And this Saturday was no different. Old friends with the new. New friends with the old. The positive energy was abundant and so powerful that it had become tangible. And I hope to grab on it now. I hope to carry it with me through the rest of training. ← 4 miles. New outlook. New confidence. New me. This was awesome to read! I never really thought that when I first stumbled upon your incredible blog last year that I would actually meet you! And meet your lovely sister (who basically was born the same week as me) AND your running coach as well! It was great times. Thank you for it. And thank you for the yummy breakfast too!